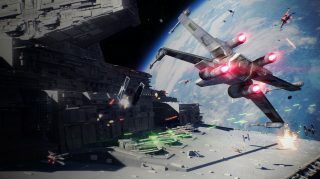 Star Wars™ Battlefront™ II is roaring into Gamescom with a never-before-seen trailer and a live gameplay debut of Starfighter Assault mode, including the all-new multiplayer space combat. You'll be able to watch the gameplay reveal live on August 21 at 9:30 AM PT, which will pit two teams of your favorite Star Wars™ Game Changers against one another in a multi-stage original trilogy-era space battle. Teams will face off in a swirling dogfight in the Fondor: Imperial Shipyard map, weaving around an Imperial Star Destroyer complete with speedy fighters, thundering bombers, distinct hero ships, and more. Will the brave pilots of the Rebel Alliance triumph against the Imperial Navy, or will the intrepid aces of the Galactic Empire foil the insurgents’ plans? The livestream will be your first glimpse at the vastly improved starfighter combat, with superior controls, deeper customization, and role-based team play featuring an all new class-based system. Tune in on August 21 at 9:30 AM PT at EA.com to see it in action, and then get ready to try it yourself. Fondor: Imperial Shipyard will join the Theed Galactic Assault map in the beta starting October 6 (or October 4 if you pre-order*). *BETA OFFER EXPIRES 3 DAYS PRIOR TO BEGINNING OF EARLY ACCESS PERIOD. Other conditions and restrictions apply. See www.ea.com/games/starwars/battlefront/battlefront-2/disclaimers for details.